Keep your coating performing its best! Dr. Beasley’s AdvanceCoat: Gloss is a maintenance product designed to enhance and extend the life of your nano coating. Added hydrophobicity keeps your coating, and therefore your paint, water repellent and will extend the life of your coating up to a few months! After that time has passed, just apply another layer of Dr. Beasley’s AdvancedCoat: Gloss and keep your protection going! Paint coatings, while they are extremely long lasting compared to natural waxes, do start to lose their effectiveness as time goes on. Over time, all nano coating lose some beading and gloss effects, and proper maintenance is the key to keeping your coating performing. Dr. Beasley’s AdvanceCoat: Gloss is a maintenance booster product for nano coatings and will turn up the gloss, glow, and hydrophobicity after just one use! Dr. Beasley’s AdvanceCoat: Gloss will fill in imperfections in your coatings surface and add an intense gloss to your paint. In fact, after just one use of Dr. Beasley’s AdvanceCoat: Gloss, it will look like you’ve reapplied your favorite nano coating! Water beading will be restored and enhanced and contaminants will stay away! Wash car to remove any loose debris and dry. 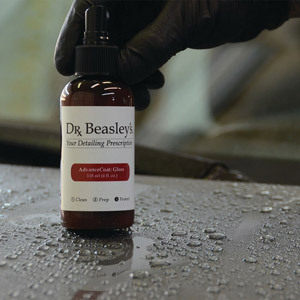 Simply spray Dr. Beasley’s AdvanceCoat: Gloss onto a clean and dry surface. Using a clean and soft microfiber towel, buff away product to a high shine. On my initial use I had issues with streaking which really show up on my black Chevy SS. Gave it another shot about a month later using less product and spraying from about a foot away; example: trunk lid got two sprays, half of hood two sprays, etc. Success! Excellent gloss and hydrophobicity. I can only give four stars because I didn't give it more than two months before I put a different LSP on my paint, therefore I can't report on manufacturers 6 month durability claim. ProsGloss! Ease of use. Great hydrophobicity. ConsStreaking from using too much product. Pricey.